Do you need a quick fair market value for your mortgage client's collateral? Do you worry unseen errors may manifest halfway through the mortgage process? Nobody likes the hassle of dealing with reassessment and rework because it can strain relations with clients. However, it becomes an inevitable reality if mortgage appraisal services are not carried out with prudence. How about hopping a few steps to field profits by having expert hands take over mortgage appraisal? Outsource2india is a leading provider of back-office services for mortgage appraisal. From analyzing creditworthiness to providing comprehensive reports we can help you evaluate the collateral with higher accuracy. Once you outsource mortgage appraisal support services to us, the rest of your team can focus on other areas of the mortgage business. We scan and securitize the report created by appraisers to flag inconsistencies. We consult multiple sources to establish the accuracy of the reported value. Our team will check if the appraisal is carried out as per the federal, state, and GSE guidelines. Also, we verify if the appraisal report is compliant with mortgage rules and regulations. If an inconsistency is noted in the appraisal report, our observation would be compiled and furnished to stakeholders for taking corrective measures. Mortgage guidelines and policies are intricate and it becomes increasingly difficult to stay abreast of all policies. So we provide appraiser evaluation to check their awareness of mortgage landscape, possession of state license, and experience in appraisal projects. Our service will help you understand if the appraisal is adherent to the Uniform Appraisal Dataset (UAD) and the Uniform Standards of Professional Appraisal Practice (USPAP). Our investigative approach will give you a peace of mind as we leave no stone unturned to assure stress-free partnership. Lenders can face financial risks by processing unverified titles. To ensure a better end-to-end experience to lenders and their clients, we offer title assessment service. We review tax information, judgment report, title transfer records, and other details associated with the collateral. After the thorough assessment, we prepare a detailed commitment report that will declare the real-time status of the property. If you want up-to-date information on the average cost of properties sold in the proximity of collateral with similar attributes, you can avail CMA. When you avail of this service, we pull data such as the listed price, the duration for which the property has remained in the market, selling price, etc. With this information at fingertips, you can fast-track financing and save more time in a single sweep without overspending. Why Choose Mortgage Appraisal Support Services from O2I? A US-based customer approached O2I, as his in-house team of underwriters was not able to manage the increase in volume. We provided him with a dedicated team of underwriters and helped him get business back on track. FYI, I have been impressed with your team's ability to learn our system so quickly. They seem to have a good grasp on how our system works, they even had to correct me on something today. Rajeev's response & attention to detail has been impressive & appreciated. I know he is on this email so I hope I'm not making him blush. Outsource2inda is a leading mortgage services company backed by 20 years of true industry experience. We are an ISO certified company whose practices are compliant with the latest mortgage regulations. 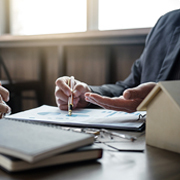 Our mortgage appraisal services are sought after by the clients who routinely appreciate the efforts we take to smoothen the relationship with their mortgage clients. With 30+ projects becoming runaway success we have the merits and resources to handle your needs. Outsource mortgage appraisal quality control to Outsource2india and enhance your company's bottom line. Know more about our comprehensive Mortgage Appraisal Support for Companies. We will be glad to assist. Get in touch with us if you want reliable mortgage appraisal services to speed up financing.